After spending the morning in South Dakota, we decided to zip across Wyoming to check out the scenery on the way to Colorado. I don’t believe I’ve seen so much sky before. I also haven’t seen a field this beautiful. Driving south on Hwy. 85 you could see a glimpse of wildflowers in the distance. We found a turn off immediately. There was a barbed gate at the turn off with a sign inviting people to walk in and take a look at the vistas and valley below. We dismantled the gate and snapped away. Thank you Wyoming! 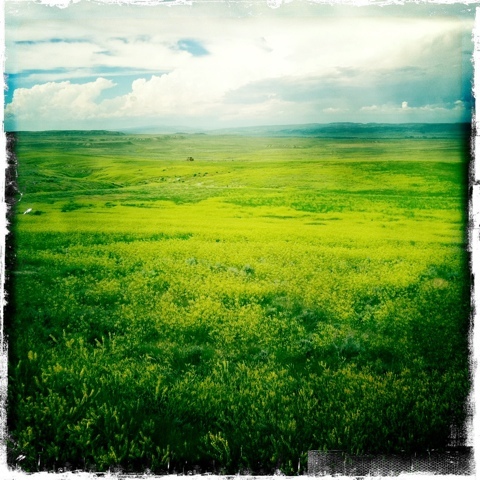 This entry was posted in Photography and tagged prairie, Wyoming. Bookmark the permalink. What awesome shooting! This is a fun trip. Thanks for bringing us along!